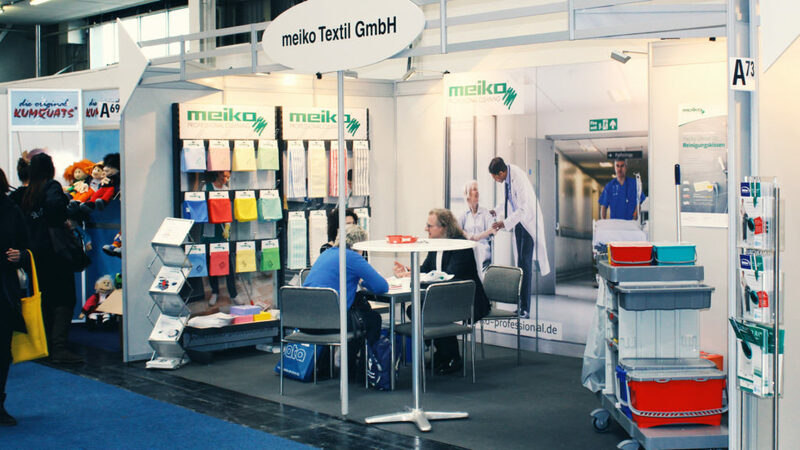 meiko showcased a product portfolio specifically tailored to the care products sector at the ALTENPFLEGE in Hanover. During the trade fair, our cleaning experts spoke to many decision-makers about the current challenges facing the sector. The topics of bacteria transmission and achieving impeccable cleaning results were the focus of many discussions. meiko offers hermetic buckets for various cleaning trolley systems. Ideal for cloth and mop preparation: the covers can thus be prepared and transported in a secure and clean way. The meiko CARE Car Med is a cleaning trolley system designed according to HACCP. Thanks to the six-litre buckets sorted in up to four colours and the two- or four-drawer compartments – also available with a dosing sieve – the CARE Car Med is also superbly suited for preparing cloths and mops. Another important question at the ALTENPFLEGE: What cleaning accessory ensures quick, impeccable cleaning results? Decision-makers are looking for well-designed, high-quality solutions, particularly for the floor area. Many of the visitors were therefore interested in the special mop covers from meiko, such as the micro brush mop ultra strong with separately integrated polyester brushes that cleans intensively and deep down in the pores even with extremely stubborn dirt and does so even without cleaning agents. Thanks to the microfibres, it is also extremely absorbent, with a deep-down effect. Our sales team is also gladly on hand to assist you with individual consultations even after the trade fair has ended. On request, we will develop your personal solutions package for you. Please give us a call and arrange a personal appointment with us.